German physician payload specialist astronaut, 1987-1993. Status: Inactive; Active 1987-1993. Born: 1960-06-19. Birth Place: Duesseldorf. Doctorate of medicine degree from Rheinisch-Westfaelische Technische Hochschule, Aachen, 1987. 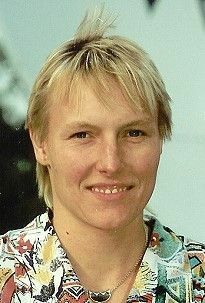 As Heike John (maiden name) member of German Team at Olympic Games 1976 (swimming). From July 1996 pilot with Deutsche Lufthansa. Married to astronaut Hans Schlegel (second marriage). Family: Astronaut. Country: Germany. Agency: DLR. Bibliography: 4452, 6178. 1960 June 19 - . Birth of Heike Walpot - . Nation: Germany. Related Persons: Walpot. German physician payload specialist astronaut, 1987-1993..
1987 August 3 - . DLR Astronaut Training Group 1 selected. - . Nation: Germany. Related Persons: Walpot. German astronaut trained for flights to the Mir space station..